Italians do not celebrate anything without food, and for more than 30 years, Dimaio Cucina has made each meal a celebration. Chef Sal Passalacqua draws on the traditions of his Sicilian heritage and brings in new, bold flavors to share his passion for delicious food. With an emphasis on the highest quality ingredients, locally sourced, at the peak of freshness. Treat yourself, your friends and your family to DiMaio Cucina where our culinary creativity relies on fresh wholesome ingredients, expert preparation and value. 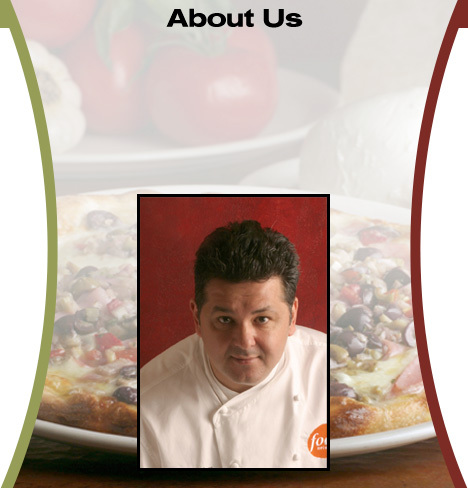 As guest chef on the Food Network for eleven years, Dimaio's chef/owner Sal Passalacqua has worked with star chefs in their kitchens and on world locations as they traveled to explore exotic cuisines. These top chefs and culinary adventures have inspired Chef Sal to create his own worldly specials. The pizza that made pizza famous-New York style thin crust pizza- There are a lot of new styles of pizza around these days, but we have been making great New York Style pizzas for the past 34 years. A great pizza is as much about the method as it is the ingredients: fresh dough made daily; 100 percent Real milk cheese; fresh tomato sauce; tempting toppings; and just the right spices. No gimmicks – just quality, commitment and taste. UpperCrust Pizza.